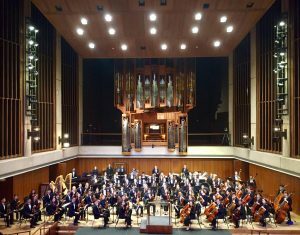 The University of Texas University Orchestra (UTUO) is UT Austin’s campus-wide orchestra, drawing its membership from throughout the university community. The orchestra rehearses weekly and performs a diverse selection of repertoire drawn from over 350 years of symphonic literature. Each year the University Orchestra performs four concerts and often features guest artists. 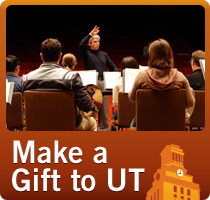 UTUO serves as just one of The Butler School of Music’s many outlets for non-music majors to continue and cultivate their devotion to the musical arts, and is open to all UT Austin undergraduates, graduate/professional school students, faculty, staff, and affiliates. The University Orchestra meets on Tuesdays and Thursdays from 7-8:30 PM in MRH 2.118 (also known as MBE 2.118). Please consult the course schedule for registration information and the correct unique number. The course number is ENS 102U for undergraduates, or ENS 182U for graduate students. Dress rehearsals (mandatory for all UTUO performers) are held 6:30-10pm in Bates Recital Hall on the Sunday prior to each Tuesday night concert.